Both Big Law firms and alternative legal service providers have been expanding in Asia. 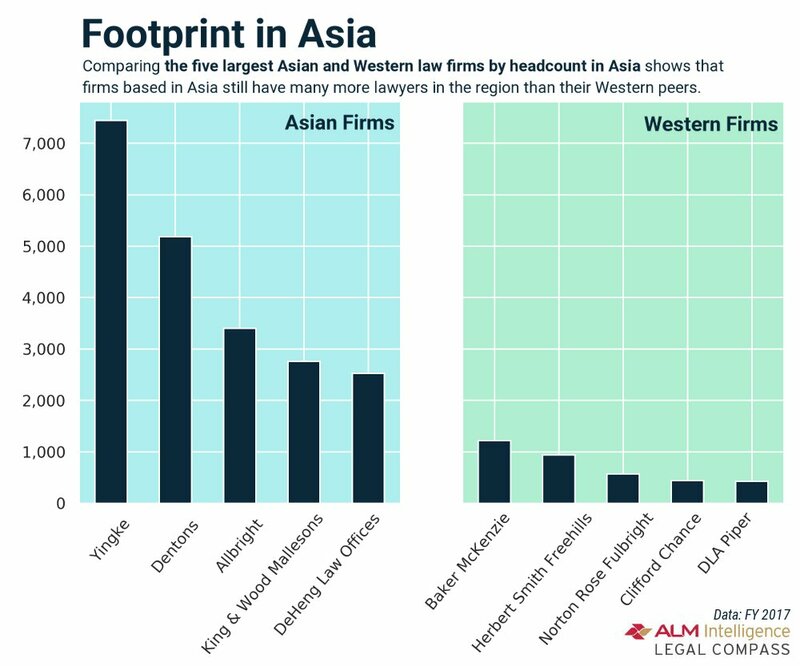 But just how big are Western law firms in Asia, compared with rivals based in the region? Pretty small, actually—but that doesn’t seem to be impacting their bottom line. The chart below shows the five Western firms with the largest headcount in Asia, compared with the five largest firms hailing from the region on ALM Intelligence’s most recent “Asia 50″ index; it’s perhaps not surprising that all of the latter category are headquartered in greater China (including Hong Kong). Some might quibble with the categorization of Dentons as an Asia-based firm; it merged with Chinese firm Dacheng Law Offices in 2015 to create the world’s largest law firm. But certainly in terms of headcount, its China presence is huge. There are other Asian nations with large law firms—such as Kim & Chang of South Korea—but they don’t register on this list because the Chinese firms are so massive. So what might this data say about how Western-based firms are co-existing with their local rivals in Asian markets? One interpretation is that local firms are continuing to thrive on work in the domestic legal system of the countries they operate in, while Western firms are handling a smaller chunk of mostly international advisory and regulatory work. That might explain why they have maintained smaller footprints. 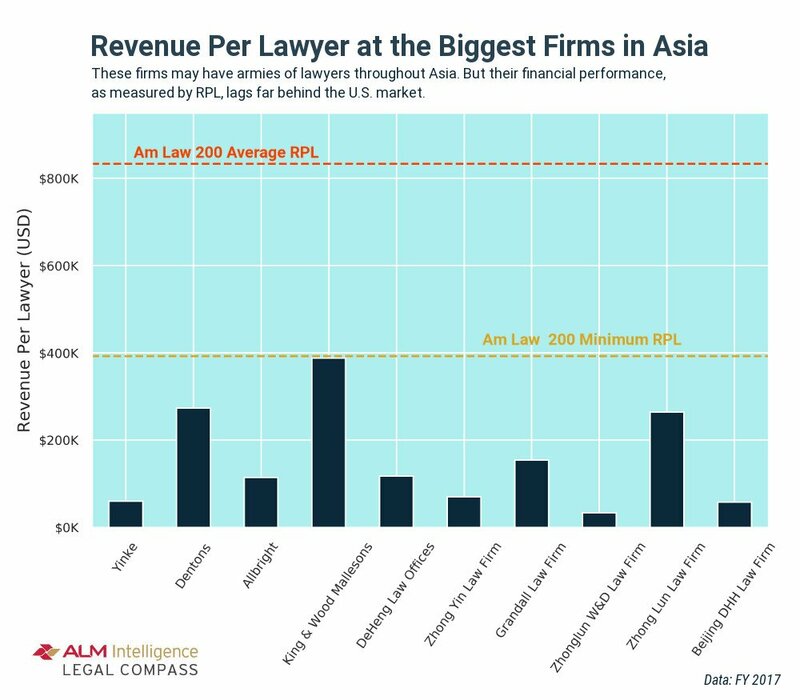 But having a massive presence in the Asian legal market doesn’t translate to robust financial performance when measured as revenue by lawyer. Perhaps not surprisingly, the average global RPL of the Am Law 200 is still far above that of the 10 largest firms by headcount in Asia. That could suggest what some in the industry have observed anecdotally: that the Asian market, in general, is not very lucrative when compared to the U.S. and Europe. It also means that Western firms can probably afford to compete for business more cheaply, if they so choose—provided that local regulations don’t stand in the way. Correction: An earlier version of this story incorrectly described a number of law firms as the most profitable in the Asian market. While the firms shown had the highest revenue per lawyer among the largest Asia-based firms, they should not have been characterized as the most profitable regional firms. In shuttering its Phoenix office, Steptoe said the location was "not aligned with the strategic direction of the firm."